My Aunt Janet wins the award for Family Cheerleader. If anyone in the family passes a test, graduates, posts a photo to Facebook or sneezes, she is johnny-on-the-spot and “Likes” it, commenting something encouraging, within seconds. Following my culinary victories (I don’t so much share the failures! Except for that one time…) has been no different. When my family visited her and her husband, Harv, in Orlando last February, she was excited to expand her culinary horizons into the vegetarian/vegan world and we took a little tour of the nearby Whole Foods. One big introduction that day was my beloved vegan Daiya cheese (which just came out with a new block form of cheese, though I have yet to witness this in person). She was excited to experiment with it and we made some simple pita pizzas the next day for lunch. The funny thing about Janet is that she was the epitome of a picky eater as a kid, or so the story goes. As one of six children, Grandma June wasn’t about to tailor make dinner for each of the kids. Apparently Janet chose to make herself a peanut butter and jelly sandwich almost nightly versus eating what the rest of the gang was eating. And now, here she is in her snowbird condo, reinventing her diet, just as she as continued to reinvent her life. It makes me happy when she reports in that she made an I Eat Veg recipe and I love getting texts from her with pictures of something new she tried. This was true on Wednesday night when I got this picture of a vegan frittata — her first experience with tofu — and she loved it! I asked her to share the recipe and definitely will be making this at some point. 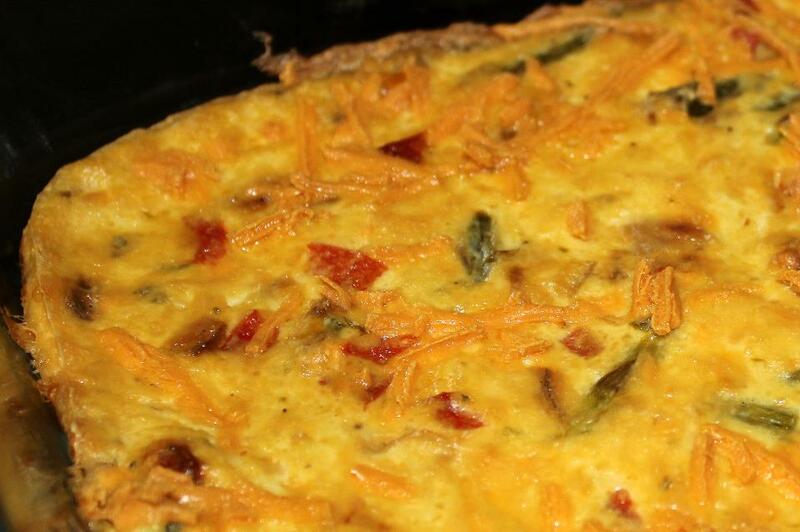 Here is the recipe for the Asparagus Frittata…..we both loved it and it warmed up beautifully the next day! ten minutes. Serve warm with (optional) salsa. broccoli, mushrooms, or anything else that sounds good! One of my “resolutions’ this year was to make use of my overabundance of food-related magazines. It only took me about 10 weeks to get to it! I cracked open my newest Food Network Magazine where, unfortunately, there are sometimes very few vegetarian recipes. So, I decided to jump on it when there was a tofu stir-fry recipe. I was doing too many things at once, so I let the peanuts burn a bit, but it was still great! 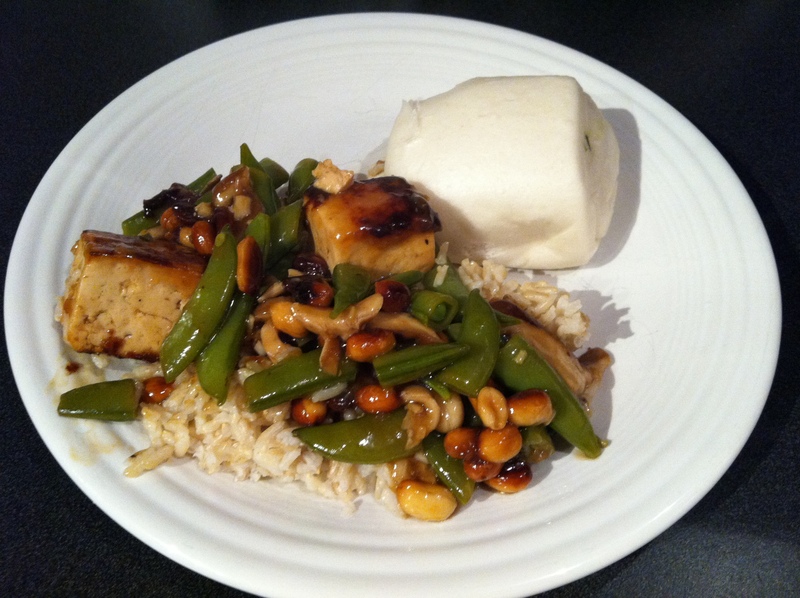 Very similar to my kung-pao that I make, due to the peanuts and the chilies, but my squeeze and I both loved it. I served it with steamed mantou (pictured). Mantou is a steamed Chinese bun you can find in the freezer section at Asian markets. 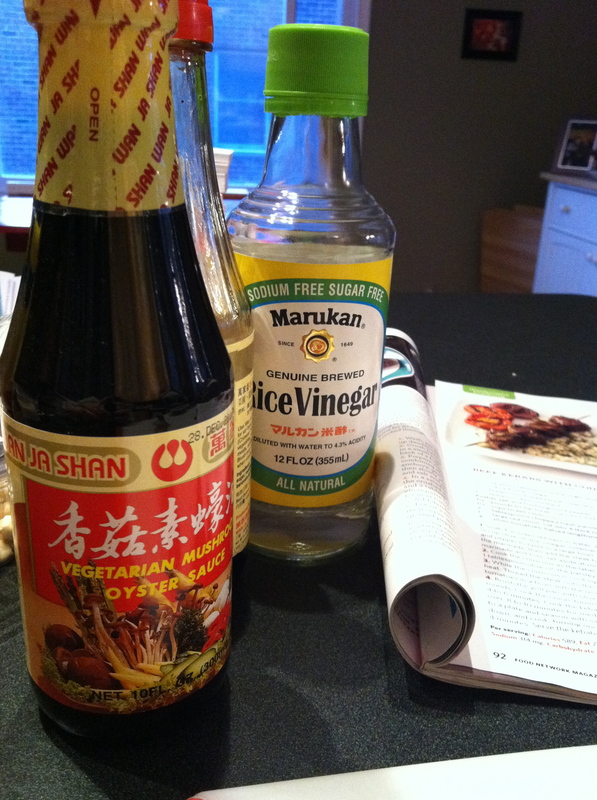 I buy them every once in a while at Kai Sun Discount Oriental Market in Troy, where I also got the vegetarian mushroom oyster sauce I use in this recipe. You keep them in the freezer, then just take out however many you want, sprinkle them with water and nuke them for about 3 minutes. Not something we eat often, but a nice addition every once in a while! Back to the recipe — it was a pretty simple one and was great over brown rice. I used a mixture of the dried red chilies and one large jalapeno, sliced into fourths, all of which we removed before eating. It gave just enough heat without making your nose run! We’ll definitely be repeating this one. • 1 pound sugar snap peas, trimmed and sliced in half (I eyeballed this – no clue how much I had since they were in bulk). 1. Whisk 2 Tbsp. cornstarch with the oyster sauce, 2 Tbsp. water and rice wine in a good-sized bowl or dish. 2. Cut the tofu in half horizontally, forming 2 large rectangles, then cut each rectangle into 4 squares. I cut my slices into 8 squares, but wish I had done as advised. Add to the marinade and turn to coat. 3. Cook the peanuts in the peanut oil in a large skillet over medium heat, stirring, until golden, about four or five minutes. Remove with a slotted spoon to a bowl. 4. Remove the tofu from marinade, but save the marinade for later. Sprinkle both sides of tofu with the remaining 4 Tbsp. of cornstarch. I did this by sprinkling one side of the tofu, then placing it cornstarch side down in the pan, then sprinkled the other side. Cook each side for about four minutes, until golden, then remove to a plate. 5. Add the ginger, garlic, chilies and/or peppers, 1 tsp. salt (I used less — just a turn or two of the grinder). Stir-fry for 30 seconds. Add the mushrooms and snap peas; stir-fry until tender crisp (or until the mushrooms look cooked to your liking). 6. Whisk 1 1/2 c. water into the reserved marinade and add to the pan. Stir until thick, 3-5 minutes. 7. Add the tofu and peanuts and heat through. Remove the dried chilies (I chose to also remove the jalapenos I was using). Enjoy! It’s been a while since I’ve reviewed any store-bought food items! The good news is that it’s been a while because I very rarely eat anything out of a can or a box or the freezer. I just cleaned out my cupboards last week and ditched about 10 boxes of random rice pilaf, falafel mix, Zatarain’s (lots of rice!) and pouches of overly sodium-laden Indian food from Trader Joe’s that I used to eat for lunch when I lived in Chicago (um…four years ago!). Needless to say, these things expired as far back as 2008. I then found myself buying a canned item this week. I can’t recall the last time I bought canned soup — not because there’s anything wrong with it. It just doesn’t occur to me and rarely sounds good to me, as much as I love soup. Maybe I overdid it when I ate Dr. McDougall’s instant soup almost every day for work during my first year in Michigan? Either way, I decided to snag a can of Amy’s Organic Country Vegetable Soup while I was at a swanky new renovated Kroger recently (the one at Woodward and 13 is getting there, but they’re seriously need to get it together at 9 Mile and Stephenson). Today, as I rush around trying to get everything done before teaching a cooking class tonight and working then leaving town tomorrow (do I really have time to be writing a blog on my delicious lunch?!?!?) I reached for the can. Open, heat, eat. It doesn’t get any easier than that. As with any meal that comes from a can, box or the freezer, it has a lot of sodium in each serving — about 25% of the recommend daily allowance. (And let’s be honest, do any of us only eat half the can? So, really, closer to 50%). Fortunately, there was no salt in my raw juice breakfast and there’s no way I’ll consume 1,000 mg of sodium in my dinner, so I think I’m good. There are lots of good things in this soup, not to mention the fact that you can taste the freshness and see actual — gasp — vegetables, beans and grains in this vegetable soup! 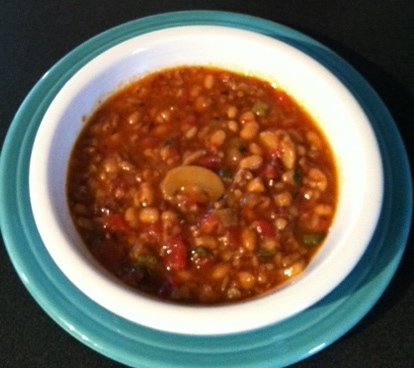 They include big sliced mushrooms, white beans, rice, tomatoes and zucchini. That means there’s fiber, protein and various vitamins in there too. I haven’t had good ol’ vegetable soup in a while, but I have to think this is the best out of a can I’ve ever had. I think I’ll try to keep at least one canned lunch around I guess.